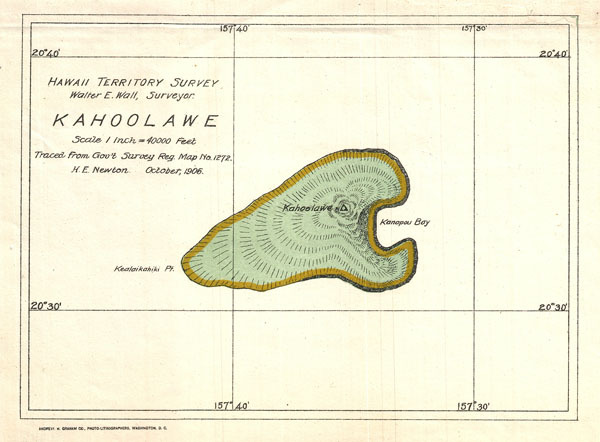 This is an uncommon 1906 map of the island of Kahoolawe was prepared for the Report of the Governor of the Territory of Hawaii to the Secretary of the Interior. Kahoolawe is the smallest of Hawaii's primary volcanic Islands and is today a nature reserve.Though the cartographic work that produced this map was started in 1878, during the Hawaiian Monarchy, the map itself, and the report that contained it, was issued following the U.S. Government's 1898 annexation of the Hawaiian Republic. The Report was an attempt to assess and examine the newly created Hawaiian Territory's potential for proper administration and development. It also features both practical and topographic details for use in administering the region. The governor at this time was George R. Carter. Very good. Printed color. Blank on verso.